While the x-axis conveys years (2004 to 2012), the points are not equally spaced. For example, in the middle chart the distance between 2011 to 2012 is larger than between other pairs of neighboring years. A trend can appear much more (or less) dramatic if the time axis is not properly spaced. The three charts all use year on the x-axis. Most readers would expect the same placement of years on all charts, yet that is not the case here due to the over-stretched distance to 2012 in the Export chart. 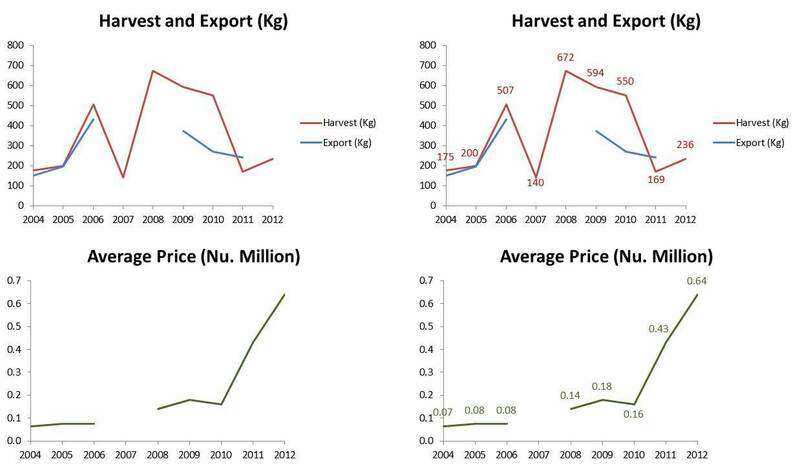 Values that appear on a line graph typically convey the y-axis value (harvest, export or average price). Including the year label just below these values is confusing and difficult to read. Using dashed lines for interpolating missing values works well. However, the extrapolation for Export in 2012 is suspect. Why is it assume to be equal to the 2011 value? It is good practice to keep the same number of decimal for all years. We automatically use the length of the number to infer its size (longer=larger). If some values include a decimal and others do not, we mistakenly infer the longer number to be larger. I recreated the charts in Microsoft Excel using the numbers from the Kuensel charts. These charts avoid the above pitfalls -- see for yourself whether a different story emerges. 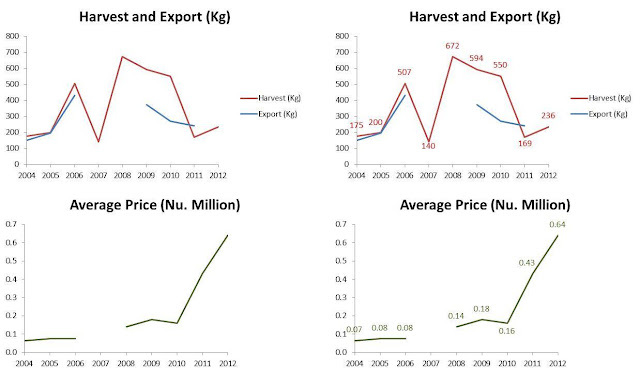 Note that I also chose to overlay the harvest and export lines in the same chart, since they share the same units and have the same order of magnitude. Line graphs are powerful for comparing trends by overlaying multiple lines on the same chart (if the scales are different, we can use double y-axis scales or normalize all the series). The two sets of charts (left and right) differ only by the inclusion of values near the lines. Note that it is easier to compare trends when there are no numbers near the lines. However, if you must include values, make sure that those are only the y-axis values, and that they have the same number of decimals. More effective use of line charts for conveying the cordyceps trends. The trends in the charts on the left are easier to grasp, compared to the right charts, which are identical but also include values. Hi Boaz, This is very good!Now Kuensel charts will be even better.